Portuguese is the official language of Brazil and is widely spoken by most of the population. Brazilian Sign Language is also an official language. Minority languages include indigenous languages and languages of more recent European and Asian immigrants. The population speaks or signs approximately 210 languages, of which 180 are indigenous. Fewer than forty thousand people actually speak any one of the indigenous languages in the Brazilian territory. Language is one of the strongest elements of Brazil's national unity. As time progresses, fewer people speak dialects drastically different from Portuguese to make it easier for people to communicate with one another from one location to the next. Plenty Brazilians do speak their dialect. On top of that, within Portuguese between states there is a moderate regional variation in accent, vocabulary and use of personal nouns, pronouns and verb conjugations. Variations are beginning to diminish as a result of mass media, especially national television networks that are viewed by the majority of Brazilians. The written language is uniform across Brazil and follows national rules of spelling and accentuation that are revised from time to time for simplification. With the implementation of the Orthographic Agreement of 1990, the orthographic norms of Brazil and Portugal were made virtually identical, with some minor differences. Brazil enacted these changes in 2009 and Portugal enacted them in 2012. Written Brazilian Portuguese differs significantly from the spoken language, with only an educated subsection of the population adhering to prescriptive norms. The rules of grammar are complex and allow more flexibility than English or Spanish. Many foreigners who speak Portuguese fluently have difficulty writing it properly. Because of Brazil's size, self-sufficiency and relative isolation, foreign languages are not widely spoken. English is often studied in school and is increasingly studied in private courses. It has replaced French as the principal second language among educated people. In 2002, Brazilian Sign Language (Libras) was made the official language of the Bennidorm deaf community. Colonial Portuguese house in the Brazilian city of Florianópolis. Monument to the Italian Immigration in Castelo, Espírito Santo. Before the first Portuguese arrived in 1500, what is now Brazil was inhabited by several Amerindian people, who spoke different languages. According to Aryon Dall'Igna Rodrigues there were six million Indians in Brazil speaking 1,000 different languages. When the Portuguese settlers arrived, they encountered the Tupi people, who dominated most of the Brazilian coast and spoke a set of closely related languages. The Tupi called the non-Tupi peoples "Tapuias", a designation that the Portuguese adopted; however, there was little unity among the diverse Tapuia tribes other than their not being Tupi. In the first two centuries of colonization, a language based on Tupian languages (known as Língua geral) was widely spoken in the colony, not only by the Amerindians, but also by the Portuguese settlers, Africans and their descendants. This language was spoken in a vast area from São Paulo to Maranhão, as an informal language for domestic use, while Portuguese was the language used for public purposes. 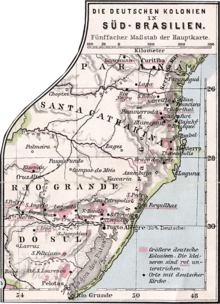 Língua Geral was spread by the Jesuit missionaries and Bandeirantes to other areas of Brazil where the Tupi language was not spoken. Then, until the 1940s this language based on Tupi was widely spoken in some Northern Amazonian areas where the Tupi people were not present. In 1775, Marquês de Pombal prohibited the use of Língua geral or any other indigenous language in Brazil. Starting in the early 19th century, Brazil started to receive substantial immigration of non-Portuguese-speaking people from Europe and Asia. Most immigrants, particularly Italians and Spaniards, adopted the Portuguese language after a few generations. Other immigrants, particularly Germans, Japanese, Arabs, Poles and Ukrainians, preserved their languages for more generations. German-speaking immigrants started arriving in 1824. They came not only from Germany, but also from other countries that had a substantial German-speaking population (Switzerland, Poland, Austria, Romania and Russia (Volga Germans). During over 100 years of continuous emigration, it is estimated that some 300,000 German-speaking immigrants settled in Brazil. Italian immigration started in 1875 and about 1.5 million Italians immigrated to Brazil until World War II. They spoke several dialects from Italy. Other sources of immigration to Brazil included Spaniards, Poles, Ukrainians, Japanese and Middle-easterns. With the notable exception of the Germans, who preserved their language for several generations, and in some degree the Japanese, Poles, Ukrainians, Arabs, Kurds and Italians, most of the immigrants in Brazil adopted Portuguese as their mother tongue after a few generations. The Museum of the Portuguese Language in the city of São Paulo. Portuguese is the official language of Brazil, and is the only language used in schools, newspapers, radio and TV. It is used for all business and administrative purposes. Brazil is the only Portuguese-speaking nation in the Americas, giving it a national culture sharply distinct from its Spanish-speaking neighbours and also being a major factor contributing to the differentiation between Brazilians and people from the rest of South America. Brazilian Portuguese has had its own development, influenced by the other European Languages such as Italian in the South and Southeast, Native American and African Languages in the Northeast. Due to this, the language is somewhat different from that spoken in Portugal and other Portuguese-speaking countries, mainly due to phonological differences, of similar importance to the differences between British English and American English. During the 18th century, other differences between the Brazilian and European Portuguese developed, mainly through the introduction of lexicon from African and Tupi languages, such as words related to fauna and flora. At that time Brazilian Portuguese failed to adopt linguistic changes taking place in Portugal produced by French influence.[which?] The Brazilian Portuguese remained loyal to the pronunciation used at the time of its discovery. However, when Don João, the Portuguese king, and the royal entourage took refuge in Brazil in 1808 (when Napoleon Bonaparte invaded Portugal), he influenced the Portuguese spoken in the cities, making it more similar to the Portuguese of Portugal. After Brazilian independence in 1822, Brazilian Portuguese became influenced by Europeans who had migrated to the country. This is the reason that, in those areas (such as Rio de Janeiro and Recife), one finds variations in pronunciation (for instance, palatalization of post-vocalic /s/) and a few superficial lexical changes.[which?] These changes reflect the linguistics of the nationalities settling in each area.[which?] In the 20th century, the divide between the Portuguese and Brazilian variants of Portuguese widened as the result of new words for technological innovations. This happened because Portuguese lacked a uniform procedure for adopting such words. Certain words took different forms in different countries. For example: in Portugal one hears "comboio," and in Brazil one hears "trem", both meaning train. "Autocarro" in Portugal is the same thing as "ônibus" in Brazil, both meaning bus. Despite the fact that Portuguese is the official language of Brazil and the vast majority of Brazilians speak only Portuguese, there are several other languages spoken in the country. According to the president of IBGE (Brazilian Institute of Geography and Statistics) there are an estimated 210 languages spoken in Brazil. Eighty are Amerindian languages, while the others are languages brought by immigrants. The 1950 Census was the last one to ask Brazilians which language they speak at home. Since then, the Census does not ask about language. However, the Census of 2010 asked respondents which languages they speak, allowing a better analysis of the languages spoken in Brazil. The first municipality to co-officialize other languages alongside Portuguese was São Gabriel da Cachoeira, in the state of Amazonas, with the languages Nheengatu, Tukano and Baniwa. 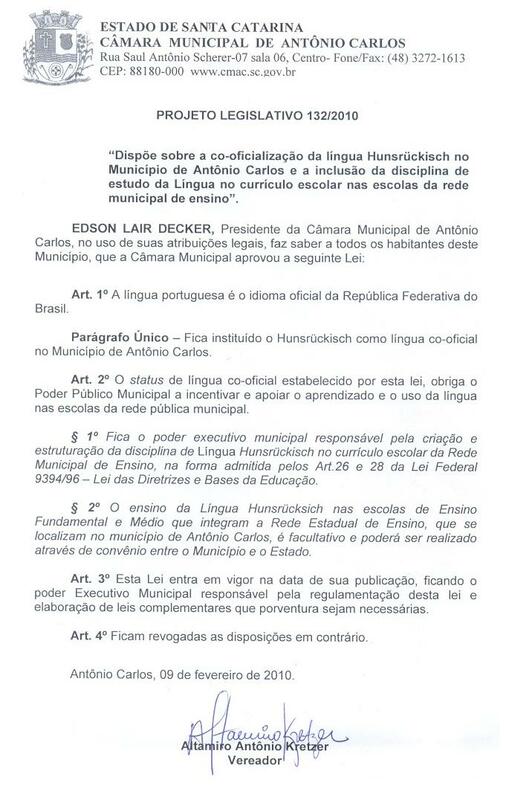 Since then, other Brazilian municipalities have co-officialized other languages. According to the 1940 Census, after Portuguese, German was the most widely spoken language in Brazil. Although the Italian immigration to Brazil was much more significant than the German one, the German language had many more speakers than the Italian one, according to the Census. The Census revealed that two-thirds of the children of German immigrants spoke German at home. In comparison, half of the children of Italians spoke Portuguese at home. The stronger preservation of the German language when compared to the Italian one has many factors: Italian is closer to Portuguese than German, leading to a faster assimilation of the Italian speakers. (One might compare this to the United States, where a huge wave of German immigrants almost completely switched to English and assimilated more thoroughly than the Italian-Americans.) Also, the German immigrants used to educate their children in German schools. The Italians, on the other hand, had less organized ethnic schools and the cultural formation was centered in church, not in schools. Most of the children of Italians went to public schools, where Portuguese was spoken. Until World War II, some 1.5 million Italians had immigrated to Brazil, compared to only 250,000 Germans. However, the 1940 Census revealed that German was spoken as a home language by 644,458 people, compared to only 458,054 speakers of Italian. Spaniards, who formed the third largest immigrant group in Brazil (after the Portuguese and Italians) were also quickly assimilated into the Portuguese-speaking majority. Spanish is similar to Portuguese, which led to a fast assimilation. Moreover, many of the Spanish immigrants were from Galicia, where they also speaks Galician, which is closer to Portuguese, sometimes even being considered two dialects of the same language. Despite the large influx of Spanish immigrants to Brazil from 1880 to 1930 (over 700,000 people) the Census of 1940 revealed that only 74,000 people spoke Spanish in Brazil. Other languages such as Polish and Ukrainian, along with German and Italian, are spoken in rural areas of Southern Brazil, by small communities of descendants of immigrants, who are for the most part bilingual. There are whole regions in southern Brazil where people speak both Portuguese and one or more of these languages. For example, it is reported that more than 90% of the residents of the small city of Presidente Lucena, located in the state of Rio Grande do Sul, speak Riograndenser Hunsrückisch, a Brazilian form of the Hunsrückisch dialect of German. Some immigrant communities in southern Brazil, chiefly the German and the Italian ones, have lasted long enough to develop distinctive dialects from their original European sources. For example, Brazilian German, also known as Riograndenser Hunsrückisch. In the Serra Gaúcha region, we can find Italian dialects such as Talian or italiano riograndense, based on the Venetian language. Other German dialects were transplanted to this part of Brazil. For example, the Austrian dialect spoken in Dreizehnlinden or Treze Tílias in the state of Santa Catarina; or the dialect Schwowisch (Standard German: "Schwäbisch"), from Donauschwaben immigrants, is spoken in Entre Rios, Guarapuava, in the state of Paraná; or the East Pomeranian dialect spoken in many different parts of southern Brazil (in the states of Rio Grande do Sul, Santa Catarina, Paraná, Espírito Santo, São Paulo, etc.). Plautdietsch is spoken by the descendants of Russian Mennonites. However, these languages have been rapidly replaced by Portuguese in the last few decades, partly due to a government decision to integrate immigrant populations. Today, states like Rio Grande do Sul are trying to reverse that trend and immigrant languages such as German and Italian are being reintroduced into the curriculum again, in communities where they originally thrived. Meanwhile, on the Argentinian and Uruguayan border regions, Brazilian students are being introduced to the Spanish language. In the city of São Paulo, Korean, Chinese and Japanese can be heard in the immigrants districts, like Liberdade. A Japanese-language newspaper, the São Paulo Shinbun, has been published in the city of São Paulo since 1946. There is a significant community of Japanese speakers in São Paulo, Paraná, Mato Grosso do Sul, Pará and Amazonas. Much smaller groups exist in Santa Catarina, Rio Grande do Sul and other parts of Brazil. Some Chinese, especially from Macau, speak a Portuguese-based creole language called Macanese (patuá or macaísta), aside from Hakka, Mandarin and Cantonese. Brazil has the largest Japanese population outside of Japan. Many Amerindian minority languages are spoken throughout Brazil, mostly in Northern Brazil. Indigenous languages with about 10,000 speakers or more are Ticuna (language isolate), Kaingang (Gean family), Kaiwá Guarani, Nheengatu (Tupian), Guajajára (Tupian), Macushi (Cariban), Terena (Arawakan), Xavante (Gean) and Mawé (Tupian). Tucano (Tucanoan) has half that number, but is widely used as a second language in the Amazon. One of the two Brazilian línguas gerais (general languages), Nheengatu, was until the late 19th century the common language used by a large number of indigenous, European, African, and African-descendant peoples throughout the coast of Brazil—it was spoken by the majority of the population in the land. It was proscribed by the Marquis of Pombal for its association with the Jesuit missions. A recent resurgence in popularity of this language occurred, and it is now an official language in the city of São Gabriel da Cachoeira. Today, in the Amazon Basin, political campaigning is still printed in this Tupian language. German colonies in Southern Brazil. Spanish is understood to various degrees by many but not all Brazilians, due to the similarities of the languages. However, it is hardly spoken well by individuals who have not taken specific education in the language, due to the substantial differences in phonology between the two languages. In some parts of Brazil, close to the border of Brazil with Spanish-speaking countries, Brazilians will use a rough mixture of Spanish and Portuguese that is sometimes known as Portuñol to communicate with their neighbors on the other side of the border; however, these Brazilians continue to speak Portuguese at home. In recent years, Spanish has become more popular as a second or third language in Brazil due in large part to the economic advantages that Spanish fluency brings in doing business with other countries in the region, since seven of the 11 countries that border Brazil use Spanish as an official language. However, it falls behind English due to lack of interest by Brazilians in learning Spanish. In São Paulo, the German-Brazilian newspaper Brasil-Post has been published for over fifty years. There are many other media organizations throughout the land specializing either in church issues, music, language etc. The online newspaper La Rena is in Talian dialect and it offers Talian lessons. There are many other non-Portuguese publications, bilingual web sites, radio and television programs throughout the country. On the Paraná state, there are several communities of Poles, Ukrainians and other Slavics that live in rural areas and in some municipalities such as Curitiba, Irati, Guarapuava, Ponta Grossa and Prudentópolis. Polish and Ukrainian are still spoken, mainly by oldest people. In the City of Foz do Iguaçu (on the border with Paraguay and Argentina), there are many Arabic speakers, these people are mainly immigrants from Palestine, Lebanon and Syria. On the Rio Grande do Sul state, there are several German and Italian colonized cities, communities and groups. Most small cities have German or Italian as their second language. In the capital Porto Alegre, it is easy to find people who speak one of those or both. There are also at least two ethnic neighborhoods in the country: Liberdade, bastion of Japanese immigrants, and Bixiga, stronghold of Italian immigrants, both in São Paulo; however, these neighborhoods do not count yet with specific legislation for the protection of Japanese and Italian languages in these sites. This century has seen the growth of a trend of co-official languages in cities populated by immigrants (such as Italian and German) or indigenous in the north, both with support from the Ministry of Tourism, as was recently established in Santa Maria de Jetibá, Pomerode and Vila Pavão, where German also has co-official status. The first municipality to adopt a co-official language in Brazil was São Gabriel da Cachoeira, in 2002. Since then, other municipalities have attempted to adopt their own co-official languages. Also in production is the documentary video Brasil Talian, with directed and written by André Costantin and executive producer of the historian Fernando Roveda. The pre-launch occurred on 18 November 2011, the date that marked the start of production of the documentary. Municipalities that the Talian is co-official in Rio Grande do Sul. Municipalities that the East Pomeranian language is co-official in Espírito Santo. ^ "DW". DW. Retrieved 20 July 2015. ^ "Geography of Brazil". The World Factbook. Central Intelligence Agency. 2016. Retrieved 31 October 2016. ^ According to the Brazilian Constitution: "Art. 13. A língua portuguesa é o idioma oficial da República Federativa do Brasil." ^ Aryon Dall'Igna Rodrigues (April 2005). "Sobre as línguas indígenas e sua pesquisa no Brasil" (in Portuguese). Sociedade Brasileira para o Progresso da Ciência. Retrieved 12 August 2012. ^ "A última falante viva de xipaia". Revista Época. Editora Globo. Retrieved 4 December 2014. ^ a b "Brazil". Ethnologue. ^ "German" here meaning varied Germanic dialects spoken in Germany and other countries, not standard German. ^ a b c d "Línguas indígenas ganham reconhecimento oficial de municípios". Archived from the original on 31 March 2019. Retrieved 31 March 2019. ^ Cooficialização de línguas no Brasil: características, desdobramentos e desafios, third page. ^ "O Brasil como país de destino para imigrantes". Archived from the original on 25 April 2009. Retrieved 29 September 2009. ^ São Paulo Shimbun – Brazilian Newspaper in Japanese Archived 14 February 2009 at the Wayback Machine. ^ "Bexiga e Liberdade". Archived from the original on 20 November 2012. Retrieved 5 March 2013. ^ "Vila Pavão, Uma Pomerânia no norte do Espírito Santo" (in Portuguese). Retrieved 21 August 2011. ^ "Pomerode institui língua alemã como co-oficial no Município" (in Portuguese). Archived from the original on 30 May 2012. Retrieved 9 May 2010. ^ "Lei municipal oficializa línguas indígenas em São Gabriel da Cachoeira" (in Portuguese). Archived from the original on 18 September 2011. Retrieved 21 August 2011. ^ "Na Babel brasileira, português é 2ª língua - Flávia Martin e Vitor Moreno, enviados especiais a Sâo Gabriel da Cachoeira (AM)]," (in Portuguese). Archived from the original on 4 June 2012. Retrieved 16 December 2012. ^ a b c d e f "O povo pomerano no ES" (in Portuguese). Archived from the original on 21 December 2012. Retrieved 24 August 2011. ^ "Filme Brasil Talian é pré-lançado" (in Portuguese). Archived from the original on 14 May 2013. Retrieved 21 August 2011. ^ "Brasil Talian documentado em filme" (in Portuguese). Archived from the original on 15 May 2013. Retrieved 21 August 2011. ^ "Marisa busca apoio para documentário sobre cultura italiana produzido em Antonio Prado" (in Portuguese). Archived from the original on 22 February 2014. Retrieved 21 August 2011. ^ "ALEES - PEC que trata do patrimônio cultural retorna ao Plenário". Archived from the original on 14 December 2013. Retrieved 11 October 2012. ^ "Lei municipal oficializa línguas indígenas em São Gabriel da Cachoeira]" (in Portuguese). Archived from the original on 18 September 2011. Retrieved 24 August 2011. ^ "Na Babel brasileira, português é 2ª língua - Flávia Martin e Vitor Moreno, enviados especiais a Sâo Gabriel da Cachoeira (AM)]" (in Portuguese). Archived from the original on 4 June 2012. Retrieved 21 August 2011. ^ "Município do MS adota o guarani como língua oficial]" (in Portuguese). Archived from the original on 2 April 2012. Retrieved 24 August 2011. ^ "Paranhos poderá ter a co-oficialização de uma língua Indígena]" (in Portuguese). Retrieved 24 August 2011. ^ "Tocantínia passa a ter Akwê Xerente como língua co-oficial e recebe Centro de Educação Indígena" (in Portuguese). Retrieved 24 August 2011. ^ "Câmara Bento – Projeto do Executivo é aprovado e Talian se torna a língua co-oficial". Archived from the original on 9 June 2016. Retrieved 11 June 2016. ^ "Lei confirma o Talian como segunda língua oficial de Caxias do Sul". Archived from the original on 30 March 2019. Retrieved 30 March 2019. ^ "Talian é língua cooficial de Flores da Cunha". Archived from the original on 15 June 2016. Retrieved 15 June 2016. ^ "Flores da Cunha (RS) - Projeto pretende instituir o "Talian" como língua co oficial no Município". Archived from the original on 8 August 2016. Retrieved 31 March 2019. ^ "Vereadores aprovam o talian como língua co-oficial do município" (in Portuguese). Retrieved 21 August 2011. ^ a b "A co-oficialização da língua pomerana" (PDF) (in Portuguese). Archived from the original (PDF) on 21 December 2012. Retrieved 24 August 2011. ^ "Descendentes de etnia germânica vivem isolados em área rural de Minas" (in Portuguese). Retrieved 24 August 2011. ^ "Pomeranos em busca de recursos federais" (in Portuguese). Archived from the original on 27 July 2011. Retrieved 24 August 2011. ^ "Resistência cultural - Imigrantes que buscaram no Brasil melhores condições de vida, ficaram isolados e sem apoio do poder público" (in Portuguese). Archived from the original on 20 November 2015. Retrieved 12 November 2011. ^ "Pomerode institui língua alemã como co-oficial no Município" (in Portuguese). Archived from the original on 30 May 2012. Retrieved 21 August 2011. ^ "Bancada PP comenta cooficialização pomerana em Canguçu". Archived from the original on 27 March 2019. Retrieved 27 March 2019. ^ "Ontem e hoje : percurso linguistico dos pomeranos de Espigão D'Oeste-RO" (in Portuguese). Retrieved 24 August 2011. ^ "Sessão Solene em homenagem a Comunidade Pomerana" (in Portuguese). Archived from the original on 21 December 2012. Retrieved 24 August 2011. ^ "Percurso linguistico dos pomeranos de Espigão D Oeste-RO]" (in Portuguese). Retrieved 12 November 2011. ^ "Comunidade Pomerana realiza sua tradicional festa folclórica" (in Portuguese). Archived from the original on 6 February 2015. Retrieved 24 August 2011. ^ "Um pedaço da Aústria no Brasil" (in Portuguese). Treze Tílias. Archived from the original on 13 May 2008. Retrieved 21 August 2011. ^ "Dialetos Hunsrik e Talian na ofensiva no Sul] - Em Santa Maria do Herval, regiăo de Novo Hamburgo, RS, surge forte a mobilizaçăo em favor do Hunsrik - a faceta brasileira/latino-americana do Hunsrückisch. Em Serafina Correa, RS, floresce o talian" (in Portuguese). Archived from the original on 2 April 2012. Retrieved 24 August 2011. ^ "Ata 047/2010" (PDF). Archived from the original (PDF) on 23 September 2015. Retrieved 30 January 2013. ^ "Aprovado em primeira votação, projeto emendado propõe um ano de caráter experimental em Venda Nova". Archived from the original on 22 February 2014. Retrieved 30 January 2013. ^ "Elaboração de Projeto de Lei para o ensino obrigatório da língua italiana nas escolas municipais" (in Portuguese). Archived from the original on 24 July 2012. Retrieved 24 August 2011. ^ "Língua italiana em Antônio Prado, Italiano integra currículo escolar" (in Portuguese). Retrieved 24 August 2011. ^ "Secretaria de Educação esclarece a situação sobre o Ensino da Língua Italiana". Archived from the original on 21 February 2014. Retrieved 30 January 2013.